I love my Honda Accord. We met in December 2000. It has been a magical relationship. We've been to Utah, Canada, California, Virginia, and parts in between. 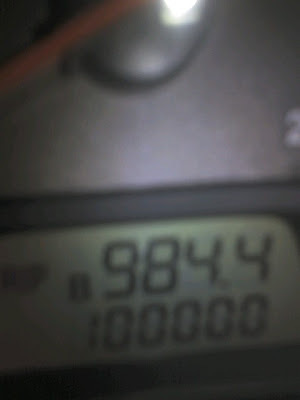 A few weeks ago she passed 100,000 miles. My Moto Q captured the magic moment in Tampa. Here's to many more. We also have a Honda Odyssey. It's the best mini-van on the planet. We decided a while back that we would not succumb to anti-mini-van prejudice. It's a great car to drive, has fantastic utility, and is silky smooth on the road. I'm in full support of your mini-van confidence. Definitely our next big car choice for me.